shunshoku 春色（しゅんしょく）"the color of spring"
shunkoo referes to the general brightness that comes with spring, not exclusively with the sunshine. These kigo refer to the sparkling of spring sunshine and a gentle wind on a sunny spring day. Some of these Chinese character combinations relate to old Chinese poems. "bright breeze" is not a kigo, but a topic for haiku. 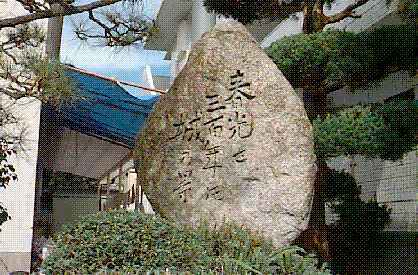 The history of 300 years"
This Haiku monument unveiled on the 15h March of 1962 (Showa 37), Mokuzen's 80th birthday. The characters on this monument is Mokuzen's own hand writing. It was the days of Sadayuki Matsudaira, the first leader of the domain of Matsuyama, of 1642 (Kanei 19), when the dungeon of Matsuyama Castle was constructed. It goes back to the old times of about 300 years ago from the year of 1962 (Showa 37). The word of "the shadow of the Castle shows the history of 300 years" just implies the deep emotion for the long history of the Castle.We can take a good sight of Castle Hill from this public hall. The old Mokuzen took on the job of teaching Haiku as many as several hundreds of times, as the leader of the Haiku gathering in Iwaidani public hall, since 1959 (at the age of 77). Japanese manga series by Taeko Watanabe.
. Sumie paintings and Haiku . momiji here means the color of red autumn leaves in the painting.